In 2091, technology is inescapable. Years of advancement have coalesced in a post-human society where rogues and miscreants can hack and control unprotected augments, send them into murderous rampages, and generally manipulate them for their own ends. Lives in 2091 are short, violent, and full of vice. 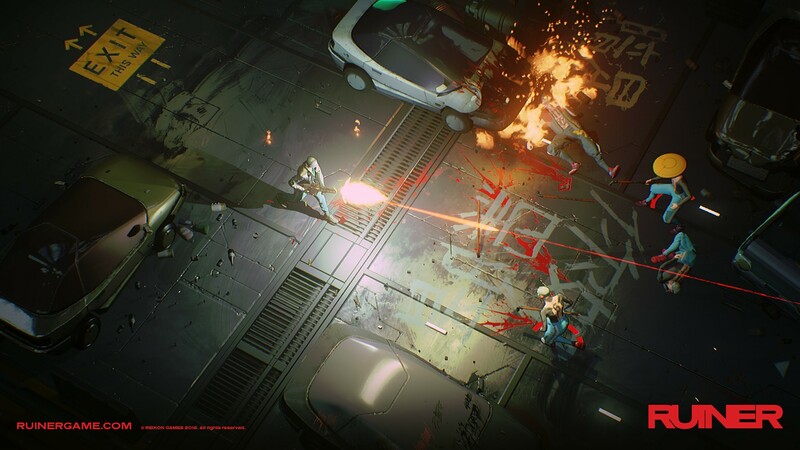 This is RUINER, a stylish cyberpunk brawler from Poland-based Reikon Games. Aping the violence of Hotline Miami and slick movement of Hyper Light Drifter, RUINER blends a thumping soundtrack with aggressive combat, incredible visuals and a heap of classic anime inspiration. It’s much more than it initially seems, and I had the chance to chat with Benedyct Szneider on the show floor at PAX West about RUINER. Here’s a bit of what I played and talked about. 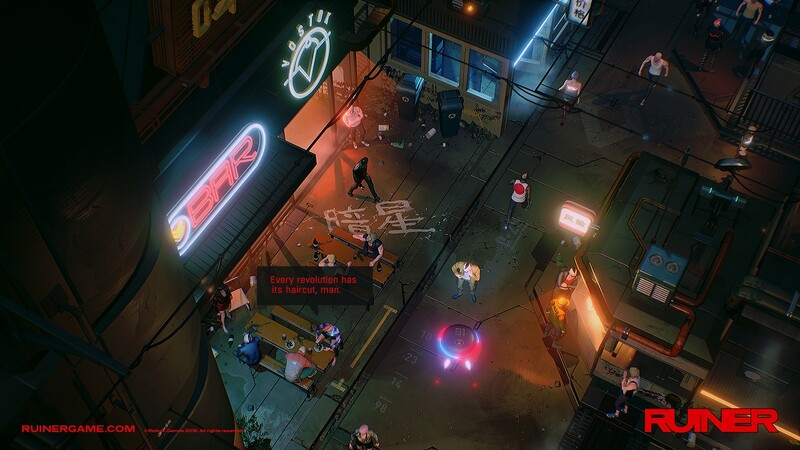 Inspired by classic anime movies and shows like Ghost in the Shell, Akira and Cowboy Bebop, RUINER is set within a fictionalized version of Bangkok called Rengkok, at the confluence of technology and humanity. The backdrop is classic cyberpunk fare, with monolithic corporations controlling technology and the dregs of humanity fighting over what little liveable space is left. The main character is a faceless man with an LED screen for a head, and a bionic arm, fighting to free his brother from the clutches of “The Boss.” You’ve been hacked a few different times by hackers with their own goals, but by and large, your main “ally” is HER, a female hacker revered by most, but with her own goals in mind. Violence and pretty visuals, what else is there to ask for. RUINER starts with a cold open into HEAVEN, a domain entirely under the control of the corporations. This is imagined as an introductory level, rife with tutorials and fairly basic enemies. Regardless, you’re taught how to do a short-range dash, link three of those dashes together simultaneously, use guns, use an energy shield, and how to make use of all the restorative stations scattered about the environment. The demo concludes with a boss fight with one Chief Watayama who wields some nasty weapons of his own, as well as having a dash as well. Even though I was powering through the earlier enemies on the easiest difficulty, I nearly died twice to the boss, were it not for some timely pickups dropped by the corpses of his lackeys. After the cold open/tutorial, we are dropped into the hub city, where we could either keep fighting more baddies, or explore, meeting a few fine folk who hand out quests, or get a feel for the environment. With its consistent color scheme of neon red, black and gray in the combat arenas, the colors in the city, though muted, pop against the bleak background. When not killing, take a relaxing walks through the city. It was in the city that we got to explore the skill trees as well. Benedyct took me on a crash course through the various skills, which were loosely broken up into three overall types: offensive, technical and passive. Offensive skills included an energy shield and a knockdown-inducing shockwave; technical skills were skills that could manipulate enemies, such as a hacking skill that temporarily made goons your allies; and passive skills meant more health, energy, dash modifiers, and more. Benedyct also showed off the radial menu, meaning that you can swap between skills on the fly, as time slows in the background. Of course, any dystopian cyberpunk game would not be complete without 80s electronic stylings and Japanese influences. To that end Reikon brought on a number of artists to compose songs for the game, including DJ Alina, Khoven, and Susumu Hirasawa, composer for surrealist anime films Paprika and Millennium Actress. The music is powerful, and even on the noise of the show floor, it demanded attention. 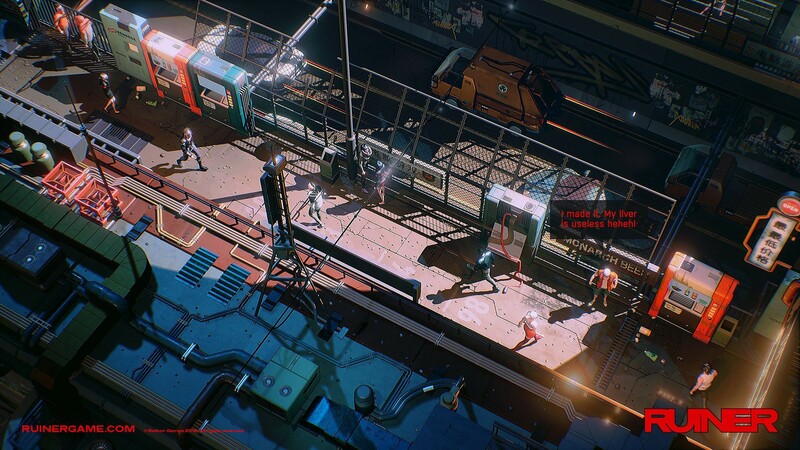 Of all the games that exuded style at PAX West, RUINER is one of the standouts. The deep, engaging combat marked with cathartic violence may well make for an excellent entry into a genre criminally underexplored. 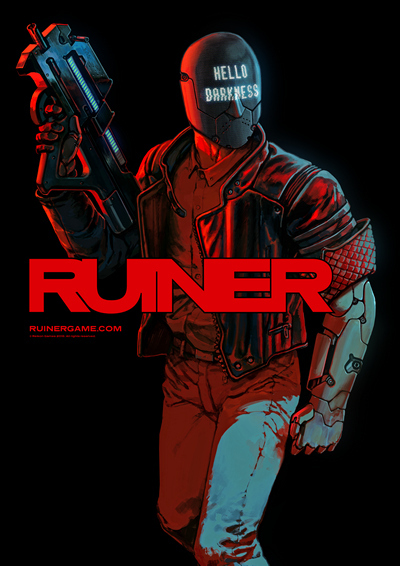 RUINER launches on September 26th.